If you're going to an after party, you will want after party clothing like a black slim fit sequin collar tuxedo jacket by Vinci. Vinci is a designer that has mens fashion blazers like dinner jackets that are pure style. 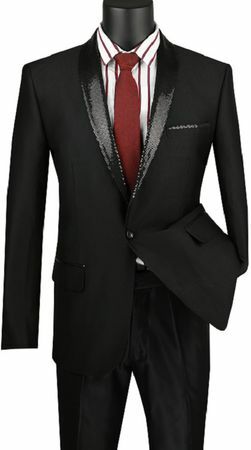 This style features a sequin pattern on the lapel with sharkskin fabric. Features side vents and comes in a slim fit. Made of Poly/Rayon.